I want to see reports. Microsoft offers Excel Services / PowerPivot for Excel, SQL Server Reporting Services (including Report Builder), Performance Point Services; which one should I use? This post shall help choose Microsoft’s data visualization tool based on reporting requirements driven by business process and stakeholder expectation and need analysis. Typically reporting styles fall into Self-Service Analysis, Business Reporting, Parameterized & Operational Reporting, Performance Monitoring and Scorecarding. Parameterized & Operational Reporting – Similar to the Business Reporting style, Parameterized &Operational Reporting is also characterized by fixed-format reports that need to be distributed to the responsible parties for each store, region, or other organizational entity in a timely manner and without requiring user involvement to locate and run the report. The reports, however, are authored and managed centrally by IT instead of business users and usually follow a pixel perfect format and rendering style. Consistency, scalability, manageability, auto-refresh and automated distribution are some of the key characteristics of this style. Data used to create reports comes from corporate-sanctioned and IT-managed data sources. Reports may be complex and require special technical skills such as advanced SQL, MDX, or other query languages to build. The reports may be delivered via portal, file share, email, or even sent directly to a printer, and may be generated as PDF, Excel, XML, comma delimited text file, TIFF image, HTML or Microsoft Word formats. Performance Monitoring – Just as a dashboard in a car helps a driver quickly understand the real-time operational performance of the automobile, a dashboard report helps business decision makers understand the current health of their business. A dashboard often combines key performance indicators from various business functions on a single page to help provide an at-a-glance view of performance and the ability to drill down further when something is off track or performing extremely well. This style is called “Performance Monitoring (Dashboard)”. This style is generally found in more mature BI environments where data points of interest have been defined, key determinants of business success have been identified, and a comprehensive BI strategy exists.Tool Options: Excel Services / PowerPivot for Excel, SQL Server Reporting Services (including Report Builder), Performance Point Services. Scorecarding – Scorecarding is a style that describes highly summarized views with Key Performance Indicators (or KPIs) measured and scored against predefined targets such as a balanced scorecard. This style is generally a part of a performance management program, though it can also be used to measure operational performance. While all of the Microsoft BI tools permit “scorecard-like”reporting, PerformancePoint Services is the Microsoft tool that enables Scorecards by using a methodology such as Balanced Scorecard or by creating your own methodology. 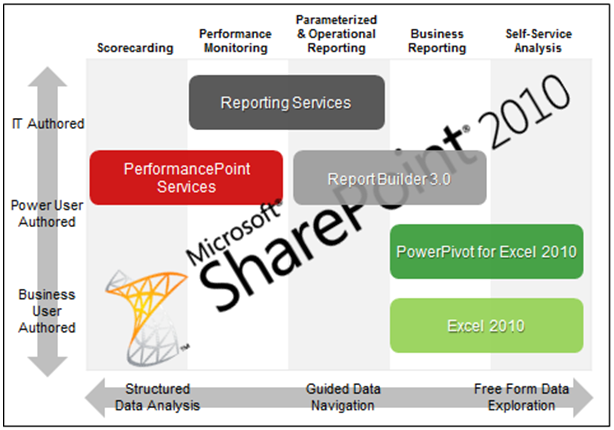 PerformancePoint Services facilitates weighted score rollups, measurement against targets, and pre-defined KPIs, in addition to providing the broader set of PerformancePoint functionality to allow integrating the Scorecard into a dashboard alongside other reporting and analysis capabilities.Tool Options: Excel Services / PowerPivot for Excel, SQL Server Reporting Services (including Report Builder), Performance Point Services. An example of a workflow is a mortgage application. A mortgage application needs to go through various stages such as: credit score check, collateral check, application approved, application declined, etc. In the above example, the application got at Status 1 on date1, at Status 2 on date2, at Status 4 on date3 and it got at status 6 on date4. SS1. What is the current status of Application 1? SS2. When did Application 2 reach Status 4? DW1. How many applications are currently on Status 4? DW2. What is the average duration (in days) between Status 2 and Status 4? The “*1.0” is to convert days column from integer to decimal so we don’t get an integer output. But, from Status 2 an application doesn’t always go to Status 4. It can go to Status 3 instead! So how do we find out which application goes from Status 2 to Status 4 (App2) and which app goes from Status 2 to Status 3 (App3)? We can’t! The “Ind” columns are indicator columns. It shows which status the application is currently on. For a background on Accumulating Snapshot you can read Kimball Toolkit book chapter 3 page 75 and his article here. There are 3 parts of this article, all about Expiry Date column in SCD type 2 dimension. 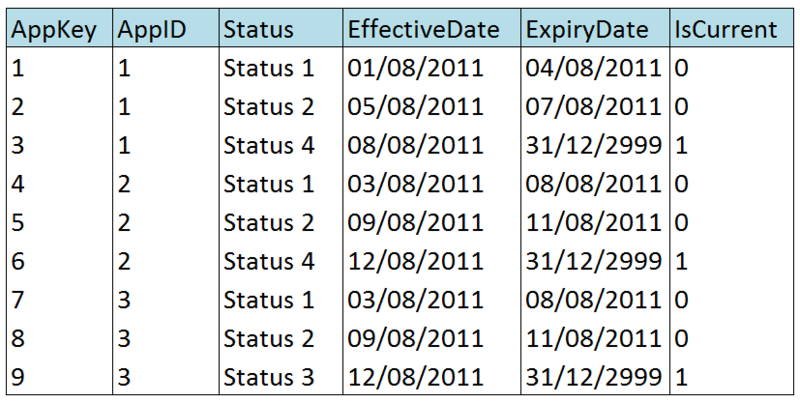 Date only Expiry Date (no time component), set to Effective Date or a day before? Expiry Date: Should We Have the Millisecond? Expiry Date of the current row: NULL or max date? If the Effective Date and Expiry Date in our SCD type 2 dimension is date only (no time component), should we set the Expiry Date = Effective Date of the new row, or a day before? The question is: should the expiry date on the first row be 05/08/2011 instead? Let’s see what happens if it’s 04/08/2011 like in the above table. If the transaction date in the source system has no time component, e.g. 03/08/2011 then it will fit nicely. The fact row will be mapped to exactly 1 row in the above type 2 dimension. But if the transaction date in the source system has the time component e.g. 04/08/2011 11:23:09 then it will “fall between the cracks” e.g. fall between the expiry of the first row (04/08/2011) and the effective date of the 2nd row (05/08/2011), so it will neither be mapped to the 1st row nor the 2nd row of the dimension. This is because 04/08/2011 means 04/08/2011 00:00:00 and 05/08/2011 means 05/08/2011 00:00:00 so 04/08/2011 11:23:09 neither belong to the 1st row nor the 2nd row. So in this case we will need to set the Expiry Date of the first row to 05/08/2011, so that 04/08/2011 11:23:09 will belong to the 1st row. We will also need to make a “convention” in the ETL that “midnight” dates (e.g. with time component = 00:00:00) will fall to the 2nd row, e.g. if the transaction date is 05/08/2011 00:00:00 then the ETL process will map it to the 2nd row. With datetime data type like above, we can be sure that a transaction date with time component will never “fall between the cracks”. It will always be mapped to a dim row. B. Should We Have the Millisecond? But what if the transaction time is 04/08/2011 23:59:59.100, i.e. 100 milliseconds after the expiry date? In a global data warehouse this is possible. Should we have the millisecond like below? This way, 04/08/2011 23:59:59 100 will belong to the first row. What if the transaction time is 04/08/2011 23:59:59.1234567? With the arrival of the datetime2 data type in 2008 this is now possible to have this time value in the source system. Datetime2 has a precision of 100 nanoseconds, i.e. 7 digits after the second. But if you use 2005, then on the ETL you need to have a convention. For example: anything that is less that 05/08/2011 (like 04/08/2011 23:59:59.1234567) will be mapped to the first row. In all the above examples, I set the Expiry Date of the current row as a max date, e.g. 31/12/9999 23:59:59.9999999. In some data warehouses, the Expiry Date of the current row is set as NULL. Which one is better and why? As always there are pluses and minuses to everything. If we put a certain date, e.g. 31st December with the year = 2999 or 9999, we will have to hardcode this date in the ETL. And it’s not only 1 place, but in many places. In the insert script of the ETL of every table. And there might cause different perceptions/understanding. Developer1 thinks it’s year 2999 whereas Developer2 may think it’s year 3999. Tester1 thinks it’s 1st Jan 9999, Tester2 may think it’s 31st Dec 9999. Documentation1 says 2999, documentation2 says 9999, etc.